Handle all your basic stapling needs with the confidence of this all metal, wide based stapler. A full rubber slipper provides stability and prevents skidding. Tacking capabilities deliver flexibility. Substantial and durable with a nice feel. Staples 2 - 20 sheets of 20 lb. paper with S.F. 4 Premium Staples. Have had this stapler for a lot of years now, and really love it. Have not had any problems, & it has never failed me. Also had another one that just broke down after probably 25 years. Tried to fix it but couldn't. Would buy another swingline in a heartbeat. they're the best. have had this stapler for many years now, and love it. have not had any problems, & it has never failed me. also had another one that just broke down after probably 25 years. tried to fix it but couldn't. would buy another swingline in a heartbeat. they're the best. 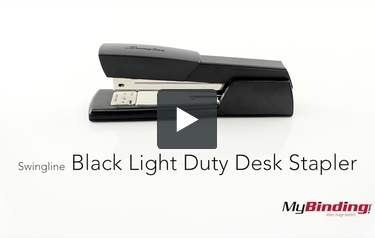 This is the Swingline Black Light Duty Desk Stapler! To load staples, hold the center shaft of the stapler and pull up on the cover. Insert 1/4” Standard or Premium staples and close it back up. By holding the base and pulling up on the shaft you can open the stapler to allow for stapling flat surfaces like a wall or cork board. You can change the punch pad too for inverted or extraverted staples. Do this by pushing on the bottom of the pad and rotating it 180 degrees. The bottom pad comes off fairly easily when you pull on it, and if removed it could get lost easily. It staples up to 20 pages with ease. Now I like to test staplers and try to jam them with excessive use, and with this one I got most of the way through the staple strip until it jammed. It doesn’t claim to be jam free, so this is no surprise—but using it appropriately should not result in a jam anyways.